Background: HRS represents the development of renal failure in cirrhotic patients. The standard treatment for HRS is terlipressin, which, as opposed to noradrenaline, is more expensive and less accessible in most tertiary care centers. Patients and methods: Thirty consecutive patients with HRS type 1 received noradrenaline (1–4.0 mg/hour) and albumin for 14 days. The parameters recorded were: serum creatinine levels, creatinine clearance, mean arterial pressure (MAP), urine output, and serum sodium levels evaluated at baseline and on treatment days 1, 3, 7, and 14. Results: Most patients achieved serum creatinine levels <1.5 mg/dL and were considered responders (22/30, 73%), whereas eight patients (27%) were nonresponders. At baseline, responders and nonresponders differed only regarding initial bilirubin levels and international normalized ratio values. Treatment duration was 7.5±3.2 days. Responders experienced a significant (p<0.05) decrease in serum creatinine levels (from 3.26±0.48 to 1.28±0.14 mg/dL), as well as a significant increase (p<0.05) in creatinine clearance (from 21±4.1 to 67.7±12.1 mL/min), urine output (from 583±41.1 to 1163±105 mL/day), MAP (from 79.2±2.94 to 93.9±2.34 mmHg), and serum sodium levels (from 125±2.01 to 132.3±1.39 mEq/L). In nonresponders, the MAP increased, but serum creatinine levels also increased, reflecting a decrease in creatinine clearance and urine output, with no significant change in serum sodium levels over the duration of the treatment. Conclusion: In most patients, noradrenaline treatment induced systemic vasoconstriction resulting in HRS reversal, with acceptable safety, in agreement with previously reported outcomes of terlipressin treatment. Since morbidity and mortality remain high once HRS is established, the focus is currently on the prevention and early therapy of renal dysfunction in patients with cirrhosis.2 Emergent liver transplantation is currently the only proven treatment, but mortality among cirrhotic patients with renal dysfunction remains high because of the insufficient availability of donors.18–22 Furthermore, compared to transplant recipients without HRS, those with HRS have lower postoperative survival and increased risk of postoperative complications.9,20 Therefore, bridge-to-transplantation solutions are needed in such patients. Moreover, treatment for HRS is required for patients who are not candidates for liver transplantation.20 Several vasoconstrictors have been evaluated for their effectiveness in patients with type 1 HRS, including vasopressin analogs (terlipressin; Sun Pharmaceuticals, Mumbai, India) and alpha-adrenoceptor agonists (midodrine, octreotide, noradrenaline; Tandem Lifesciences, Hyderabad, India). Terlipressin is costly and not universally available, and has ischemic side effects with abdominal cramps and diarrhea; moreover, it has not been sufficiently studied to determine the therapeutic protocol with the best efficacy/safety ratio.23,30 On the other hand, noradrenaline has proved safe, is widely available, and has lower cost, suggesting that it may be a more advantageous solution.32–35 The negative effects of noradrenaline, including atypical chest pain findings with normal electrocardiogram and enzyme reports are mostly self-limiting.34 The few studies focused on the use of noradrenaline consistently reported the effectiveness of noradrenaline for improving renal function in patients with HRS. Nevertheless, these studies included relatively few patients, and only one study was randomized. Therefore, important clinical information such as therapeutic efficacy in specific target populations and the effect of treatment on patient outcomes remain to be clarified. Based on the data reported to date,24–29 it is recognized that type 1 HRS is reversible following treatment with intravenous albumin and vasoconstrictors in 60%–75% of patients, as serum creatinine levels drop to below 1.5 mg/dL, resulting in improved survival. However, both therapeutic components are necessary (i.e., albumin and vasoconstrictor), as a single-agent treatment did not revert HRS. The present study aimed to observe the response of patients with HRS to treatment involving noradrenaline and albumin, as well as to assess the results in the context of available data on the effectiveness of known vasopressors such as terlipressin and midodrine. This type of investigation is especially relevant in the clinical setting of general hospitals located in areas with a poor socioeconomic condition, where intensive monitoring and expensive treatments such as terlipressin are not available. The study was conducted in the Department of Medicine of Lady Hardinge Medical College in New Delhi, India, over a period of 1½ years (between October 2012 and March 2014). The study was designed as a prospective observational study with a sample size of 30 patients. The following inclusion criteria were applied: age between 18 and 70 years; satisfying the revised diagnostic criteria of HRS listed by the International Ascites Club in 2007, namely, cirrhosis with ascites and elevation in serum creatinine levels (beyond 1.5 mg/dL) that did not improve within 48 hours of diuretic withdrawal and volume expansion with albumin; absence of shock; no current or recent treatment with nephrotoxic drugs; no findings of parenchymal renal disease or obstructive uropathy on laboratory and ultrasound assessment;2,5 and characteristic findings of HRS type 1, namely, the doubling of serum creatinine levels to a value higher than 2.5 mg/dL in a period of 2 weeks or less. The following exclusion criteria were applied: history of coronary disease; and evidence of ventricular arrhythmia or cardiomyopathy obtained based on history taking, risk factor evaluation, physical examination, echocardiography, and radiography. Written informed consent for participation was obtained from all patients selected according to the criteria described above. Ethical approval for the study (reference number LHMC/ECHR/2012/256) was obtained from the Ethical Review Board for Human Research of the University of Delhi. For all enrolled patients, detailed medical history was taken, including any past medical illness, smoking, alcohol intake, and use of hepatotoxic drugs. The general physical examination focused on identifying signs of liver failure. Patients with suspected HRS were started on noradrenaline at an initial dose of 1 mg/hour by continuous infusion. This was gradually increased up to a maximum dose of 4 mg/hour in order to achieve a mean arterial pressure (MAP) of at least 12 mmHg or a 12-hour urine output of at least 400 mL. The patients additionally received daily intravenous infusions with 20% albumin (20–40 g/day) until the end of the study period. No diuretics were used during the study period, but all patients received prophylaxis with third-generation cephalosporins. For the accurate measurement of urine output, all patients received an indwelling urinary catheter, which was maintained until HRS was reverted. Investigations were carried out in all patients to evaluate the following parameters: complete blood counts, liver function, levels of viral markers, kidney function, prothrombin time, international normalized ratio (INR), urine routine microscopy findings, urine output, ascitic fluid cytology results, and abdominal ultrasound findings. Creatinine clearance was calculated using the latest accepted formula for the Chronic Kidney Disease Epidemiology Collaboration (CKD-EPI) equation developed by the Chronic Kidney Disease Epidemiology Collaboration. The response to noradrenaline treatment was interpreted regarding the following study results: MAP improvement of >10 mmHg, decrease in serum creatinine levels to below 1.5 mg/dL, increase in 4-hour urine output to above 200 mL, and statistically significant improvement in creatinine clearance and serum sodium levels. Measurements were performed at baseline and on days 1, 3, 7, and 14 of treatment. For each outcome evaluated, the differences between the values recorded at various time points were assessed using repeated measures analysis of variance, whereas the differences between responders and nonresponders were assessed using the unpaired Student’s t-test. Differences were considered significant if the null hypothesis could be rejected at the 0.05 probability level. All statistical analyses were performed using the SPSS version 17.0 statistical package (SPSS Inc., Chicago, IL, USA). Between October 2012 and March 2014, 30 consecutive patients admitted to our hospital with decompensated cirrhosis and HRS type 1 were enrolled in the present study. Most patients were admitted within 48 hours of a decrease in urine output. Of the 30 patients enrolled, 22 (73% of the study sample) achieved the primary outcome of our study, namely, a reduction in serum creatinine levels to below 1.5 mg/dL after 14 days of treatment. These 22 patients were labeled as responders, whereas the remaining 8 patients (27% of the study sample), who did not achieve the primary outcome, were labeled as nonresponders. The baseline clinical profiles of the patients are given in Table 1. Note: aData presented as mean ± SD. A statistically significant difference between responders and nonresponders was observed in terms of the baseline values of serum bilirubin levels and INR (p<0.001 for both). In our study sample, the mean Child–Pugh Score at baseline was 9.4±1.4, with significantly lower values in responders than in nonresponders (8.8±1.05 vs. 11.2±0.70, respectively; p<0.001). Similarly, the baseline model for end-stage liver disease (MELD) score in responders was 26±4 and among the non-responders was 38±3. HRS may occur spontaneously (typically in type 2 HRS) or may be triggered by a precipitating factor.43 The most common trigger is the development of spontaneous bacterial peritonitis, which was seen in 11 patients (36.6%) at baseline. No cases of HRS due to large volume paracentesis were observed because the paracentesis was accompanied with intravenous albumin replacement. For the entire study sample (30 patients), the mean duration of therapy was 7.5±3.2 days. Among the 22 responders, 3 achieved the primary outcome (serum creatinine levels <1.5 mg/dL) on day 3 of treatment, while 18 responded on day 7 and 1 responded on day 14 (mean response time, 6.7±2.1 days). The mean duration of treatment in nonresponders was 9.5±4.8 days. 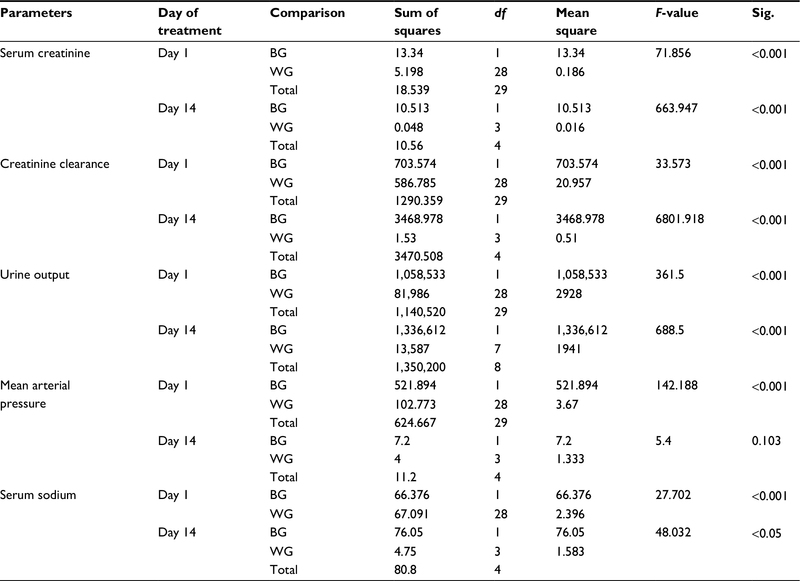 Among the eight nonresponders, four expired between treatment days 4 and 6 (two patients on day 5, one patient on day 4, and one patient on day 6); the remaining 4 patients did not achieve the primary outcome even after 14 days of treatment. The main identifiable causes of death were sepsis (one) and hepatic failure (one). The response to treatment was judged in terms of the following parameters: serum creatinine levels, creatinine clearance, urine output, MAP, serum sodium concentration, and glomerular filtration rate (GFR) calculation based on the Royal Free Hospital cirrhosis GFR.44 These parameters were measured at baseline and on treatment days 1, 3, 7, and 14. On the other hand, nonresponders did not exhibit positive changes in the outcome measures following treatment with noradrenaline: serum creatinine levels changed from 4.33±0.21 to 4.87±0.28 mg/dL; creatinine clearance changed from 15.3±2.6 to 12.6±1.5 mL/min; urine output changed from 468±51.9 to 223±44 mL/day; MAP changed from 70.2±0.70 to 85.5±8.12 mmHg; serum sodium levels changed from 123.8±1.80 to 123.5±2.20 mEq/L; and estimated GFR deteriorated from 9.92±1 to 9.49±0.8 mL/min/1.73 m2. The differences between pre- and posttreatment values are given in Table 2, whereas the step-by-step changes in biochemical parameters over the 14-day course of the study are listed in Table 3. An analysis of variance-based comparison between responders and nonresponders is provided in Table 4 and represented graphically in Figure 1. Abbreviations: GFR, glomerular filtration rate; MAP, mean arterial pressure; t/t, treatment. Note: Data presented as mean ± SD unless otherwise stated. Abbreviations: ANOVA, analysis of variance; BG, between groups; df, degrees of freedom; Sig., significance level; WG, within group. Figure 1 Line chart showing the trend of five biochemical values (means) studied over 14 days of treatment. The present study analyzed the clinical and biochemical profiles as well as treatment outcomes of 30 cirrhotic patients with HRS, who were administered noradrenaline and albumin for reverting HRS. Of the 30 patients enrolled, 22 achieved the primary outcome of reduction in serum creatinine levels to below 1.5 mg/dL. Such patients were considered responders to noradrenaline therapy, whereas the other eight patients, who did not achieve the primary outcome even after 14 days of treatment, were considered nonresponders to noradrenaline therapy. All patients included in our study received treatment with noradrenaline because terlipressin and midodrine were not available in the hospital’s pharmacy and the patients could not afford to buy these other drugs. Therefore, we could not perform a comparative study regarding the therapeutic outcomes of these agents. However, we compared the results of our study with the results of previously published studies that had used other vasoconstrictors. The clinical outcomes (response rate) and biochemical profiles of HRS patients treated with various vasoconstrictors are briefly outlined in Table 5. Abbreviations: Cr Cl, creatinine clearance; HRS, hepatorenal syndrome; MAP, mean arterial pressure; t/t, treatment. Response to noradrenaline (i.e., reversal of HRS) was observed both in the present study (73%) and in previous studies. Moreover, in responders, noradrenaline administration was followed by a statistically significant and rapid improvement in renal function (reduction in serum creatinine levels, increase in creatinine clearance and urine output), as well as by a large increase in MAP and serum sodium concentration. In nonresponders (presently, 27%), MAP increased, but serum creatinine levels also increased, reflecting a decrease in creatinine clearance and urine output, with no significant change in serum sodium levels over the duration of the treatment. The treatment of HRS using alpha-adrenergic agonists has already been reported. We found that, despite treatment, the renal function of nonresponders continued to deteriorate. Nonresponse in some patients may be due to the increased levels of vasodilator cytokines,37 increased bacterial products or latent infections,38 and the presence of concomitant adrenal insufficiency39 or acute tubular necrosis.40 In other words, the greater extent of arterial vasodilatation may have been higher in nonresponders. It is also of note that, compared to responders, nonresponders tended to have more severe liver disease, with higher Child–Pugh scores and higher baseline serum creatinine levels. Based on data from studies that used other vasoconstrictors (midodrine plus octreotide or terlipressin, as mentioned in Table 4), we may conclude that noradrenaline probably exerts a more powerful vasoconstrictive action than that of oral midodrine. Therefore, noradrenaline could be used as a single-agent therapy to revert HRS, whereas midodrine may require concomitant vasodilator inhibition to achieve clinical efficacy. Overall, noradrenaline was well tolerated. Although four of the eight nonresponders expired during the study period, the cause of death was not attributed to noradrenaline use. The stability of the INR values over the course of the study suggests that noradrenaline did not induce hepatic ischemia. The cost-effectiveness of noradrenaline is a major advantage over terlipressin, as found by Singh et al,34 who reported a cost of treatment of 945 € and 275 € in the terlipressin and noradrenaline group, respectively (p<0.05). However, the total cost of treatment did not include the cost of albumin and hospital expenses in the calculation and analysis, which is relatively low in India. Moreover, compared to other potentially useful therapies for HRS, such as implantation of a transjugular intrahepatic portosystemic shunt or the molecular adsorbent recirculating system, vasoconstrictor drugs can be administered to all patients with HRS, regardless of the severity of liver failure, and can be used in all clinical settings. Our present findings strongly suggest that noradrenaline treatment induces systemic vasoconstriction resulting in the reversal of HRS, with a good response rate, fast response time, and adequate safety. These results are similar to those previously obtained for terlipressin in the treatment of HRS. Prospective studies are, therefore, required to compare the clinical efficacy, safety, and cost-effectiveness of noradrenaline and terlipressin for HRS reversal. The results of the present study are especially encouraging, considering the context of a general hospital like ours, where neither intensive monitoring nor expensive drugs such as terlipressin are routinely available. This study provides the basis for designing larger randomized controlled trials to confirm the present findings. Further studies should also aim to identify predictors of nonresponsiveness, so that patients who are unlikely to respond to medical therapy with a particular vasoconstrictor could receive a different therapeutic agent or be preferentially indicated for liver transplantation. This manuscript contains discussion about the investigational use of unlabeled noradrenaline, terlipressin, midodrine, and albumin. None of these products has yet received US Food and Drug Administration approval for use in the treatment of hepatorenal syndrome. Betrosian AP, Agarwal B, Douzinas EE. Acute renal dysfunction in liver diseases. World J Gastroenterol. 2007;13(42):5552–5559. Arroyo V, Fernandez J, Gines P. Pathogenesis and treatment of hepatorenal syndrome. Semin Liver Dis. 2008;28:81–95. Munoz SJ. The hepatorenal syndrome. Med Clin N Am. 2008;92:813–837. Helvig FC, Schutz CB. A liver and kidney syndrome: clinical, pathological, and experimental studies. Surg Gynecol Obstet. 1932;55:570–582. Salerno F, Gerbes A, Gines P, Wong F, Arroyo V. Diagnosis, prevention and treatment of hepatorenal syndrome in cirrhosis. Gut. 2007;56:1310–1318. Moreau R, Lebrec D. Diagnosis and treatment of acute renal failure in patients with cirrhosis. Best Pract Res Clin Gastroenterol. 2007;21:111–123. Sherman DS, Fish DN, Teitelbaum I. Assessing renal function in cirrhotic patients: Problems and pitfalls. Am J Kidney Dis. 2003;41:269–278. Arroyo V, Gines P, Gerbes AL, et al. Definition and diagnostic criteria of refractory ascites and hepatorenal syndrome in cirrhosis. Hepatology. 1996;23:164–176. Gines P, Guevara M, Arroyo V, Rodés J. Hepatorenal syndrome. Lancet. 2003;29:1819–1827. Ruiz-del-Arbol L, Monescillo A, Arocena C, et al. Circulatory function and hepatorenal syndrome in cirrhosis. Hepatology. 2005;42:439–447. Marik PE, Wood K, Starzl TE. The course of type 1 hepatorenal syndrome post liver transplantation. Nephrol Dial Transplant. 2006;21:478–482. Shusterman B, Mchedishvili G, Rosner MH. Outcomes for hepatorenal syndrome and acute kidney injury in patients undergoing liver transplantation: a single center experience. Transplant Proc. 2007;39:1496–1500. Arroyo V. The liver and the kidney: mutual clearance or mixed intoxication. Contrib Nephrol. 2007;156:17–23. Guevara M, Gines P, Bandi JC, et al. Transjugular intrahepatic portosystemic shunt in hepatorenal syndrome: effects on renal function and vasoactive systems. Hepatology. 1998;28:416–422. Moreau R, Lebrec D. Acute renal failure in patients with cirrhosis: perspective in the age of MELD. Hepatology. 2003;37:233–243. Angeli P, Merkel C. Pathogenesis and management of hepatorenal syndrome in patients with cirrhosis. J Hepatol. 2008;48:S93–S103. Appenrodt B, Zielinski J, Brensing KA, et al. Degree of hepatic dysfunction and improvement of renal function predict survival in patients with HRS type I: a retrospective analysis. Eur J Gastroenterol Hepatol. 2009;21(12):1428–1432. Moore K. The hepatorenal syndrome. Clin Sci. 1997;92:433–443. Wong F, Blendis L. New challenge of hepatorenal syndrome: prevention and treatment. Hepatology. 2001;34:1242–1251. Moreau R. Hepatorenal syndrome in patients with cirrhosis. J Gastroenterol Hepatol. 2002;17:739–747. Gines P, Cardenas A, Arroyo V, Rodés J. Management of cirrhosis and ascites. N Engl J Med. 2004;350:1646–1654. Alessandria C, Ozdogan O, Guevara M, et al. MELD score and clinical type predict prognosis in hepatorenal syndrome: relevance to liver transplantation. Hepatology. 2005;41:1282–1289. Gluud LL, Christensen K, Christensen E, Krag A. Systematic review of randomized trials on vasoconstrictor drugs for hepatorenal syndrome. Hepatology. 2010;51:576–584. Moreau R, Durand F, Poynard T, et al. Terlipressin in patients withcirrhosis and type 1 hepatorenal syndrome: a retrospective multicenter study. Gastroenterology. 2002;122:923–930. Uriz J, Gines P, Cardenas A, et al. Terlipressin plus albumin infusion: an effective and safe therapy of hepatorenal syndrome. J Hepatol. 2000;33:43–48. Ortega R, Gines P, Uriz J, et al. Terlipressin therapy with and without albumin for patients with hepatorenal syndrome: results of a prospective nonrandomized study. Hepatology. 2002;36:941–948. Angeli P, Volpin R, Gerunda G, et al. Reversal of type 1 hepatorenal syndrome with the administration of midodrine and octreotide. Hepatology. 1999;29:1690–1697. Guevara M, Gines P, Fernandez-Esparrach G, et al. Reversibility of hepatorenal syndrome by prolonged administration of ornipressin and plasma Volume expansion. Hepatology. 1998;27:35–41. Gulberg V, Bilzer M, Gerbes AL. Long-term therapy and retreatment of hepatorenal syndrome type 1 with ornipressin and dopamine. Hepatology. 1999;30:870–875. Kam PC, Williams S, Yoong FF. Vasopressin and terlipressin: pharmacology and its clinical relevance. Anaesthesia. 2004;59(10):993–1001. Alessandria C, Ottobrelli A, Debernardi-Venon W, et al. Noradrenalin vs. terlipressin in patients with hepatorenal syndrome: a prospective, randomized, unblinded, pilot study. J Hepatology. 2007;47:499–505. Duvoux C, Zanditenas D, Hezode C, et al. Effects of noradrenalin and albumin in patients with type−1 hepatorenal syndrome: a pilot study. Hepatology. 2002;36(2):374–380. Sharma P, Kumar A, Shrama BC, Sarin SK. An open label, pilot, randomized controlled trial of noradrenaline versus terlipressin in the treatment of type 1 hepatorenal syndrome and predictors of response. Am J Gastroenterol. 2008;103:1689–1697. Singh V, Ghosh S, Singh B, et al. Noradrenaline vs. terlipressin in the treatment of hepatorenal syndrome: a randomized study. J Hepatol. 2012;56(6):1293–1298. Ghosh S, Choudhary NS, Sharma AK, et al. Noradrenaline vs terlipressin in the treatment of type 2 hepatorenal syndrome: a randomized pilot study. Liver Int. 2013;33(8):1187–1193. Cardenas A, Gines P, Uriz J, et al. Renal failure after gastrointestinal bleeding in cirrhosis: incidence, clinical course, predictive factors, and short term prognosis. Hepatology. 2001;34:671–676. Newby DE, Jalan R, Masumori S, Hayes PC, Boon NA, Webb DJ. Peripheral vascular tone in patients with cirrhosis: role of the reninangiotensin and sympathetic nervous systems. Cardiovasc Res. 1998;38:221–228. Trawale JM, Paradis V, Rautou PE, et al. The spectrum of renal lesions in patients with cirrhosis: a clinicopathological study. Liver Int. 2010;30:725–732. Ambrosino G, Naso A, Feltracco P, et al. Cytokines and liver failure: modification of TNF-a and IL–6 in patients with acute on chronic liver decompensation treated with molecular adsorbent recycling system (MARS). Acta Biomed. 2003;74(Suppl 2):7–9. Wasmuth HE, Kunz D, Yagmur E, et al. Patients with acute on chronic liver failure display “sepsis-like” immune paralysis. J Hepatol. 2005;42:195–201. Solanki P, Chawla A, Garg R, Gupta R, Jain M, Sarin SK. Beneficial effects of terlipressin in hepatorenal syndrome: a prospective, randomized placebo-controlled clinical trial. J Gastroenterol Hepatol. 2003;18:152–156. Wong F, Pantea L, Sniderman K. Midodrine, octreotide, albumin, and TIPS in selected patients with cirrhosis and type 1 hepatorenal syndrome. Hepatology. 2004;40:55–64. Wadei HM, Mai ML, Ahsan N, Gonwa TA. Hepatorenal syndrome: pathophysiology and management. Clin J Am Soc Nephrol. 2006;1(5):1066–1079. Kalafateli M, Wickham F, Burniston M, et al. Development and validation of a mathematical equation to estimate glomerular filtration rate in cirrhosis: the royal free hospital cirrhosis glomerular filtration rate. Hepatology. 2017;65:582–591.